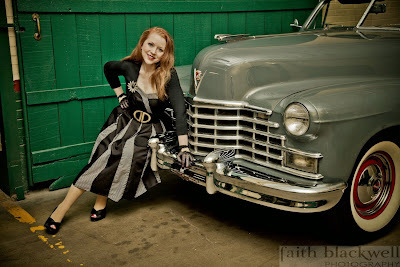 Red's Shoe Diaries: Viva Vintage! Last month, I had the good fortune to travel to Chicago with the Indianapolis Museum of Art's Fashion Arts Society for a two day excursion that included an art studio tour; a private reception and presentation at Burberry's flagship store on the Magnificent Mile; and a visit to a vintage clothing showroom; along with plenty of supping, sipping, and sharing stories with an incredibly diverse group of women who share a kindred fondness for fashion. I had never seen a hat like this before my visit to the Viva Vintage showroom, and it caught my eye as soon as I stepped inside. I'm a solo shopper - I like to browse at my own pace, and rarely feel the need for input from others when making decisions. If I don't love a garment the minute I try it on, I'm probably not going to buy it, regardless of the opinions of any shopping companion or salesclerk (this philosophy dramatically decreases the chance that the item will still have the tags on it two years later!) And yet, exploring vintage styles and trying on one of a kind items with my FAS companions was was a highly enjoyable exception to my typical one-woman shopping show. I think it was a combination of the women themselves and the festive party atmosphere created by the owner and hostess of Viva Vintage Clothing, who opened her showroom especially for us on a Monday afternoon. I paired the hat with onyx earrings and a simple black beaded necklace that belonged to my grandmother. Classic pearls would also coordinate well, but I wanted to a splash of black to add balance to knee high black boots and black tights. And WOW, what a showroom it was! Viva Vintage Clothing has a large yet well curated collection, and its owner (a fellow "ginger") is extremely knowledgeable about the garments, hats, handbags, and assorted accessories she sells. Like me, she knows there is a place for vintage clothing in the modern world. With a little thought, vintage pieces can add panache to your personal style without making you look like you're wearing a period costume. I'd never worn a tilt hat before, and wasn't sure how to keep it on, but the boutique owner provided a hat pin, and showed me how to use one to secure it! I discovered both of these hats at Viva Vintage. In fact, in a wall of elegantly displayed chapeaus, these two were the first to catch my eye and the first that I tried on. The black hat is a wool felt "tilt hat" from the 1940s. 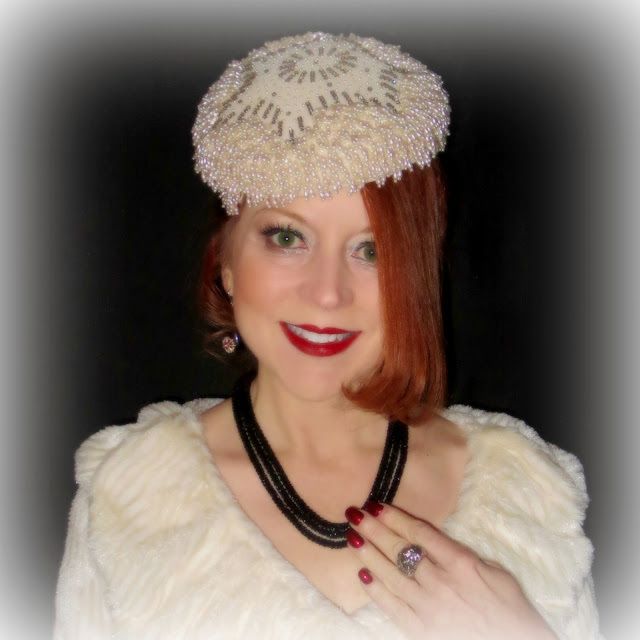 When I wore it last weekend for an elegant formal dinner party, I added a crystal brooch to the back for a little sparkle (see botton photo), and paired it with a modern lace dress by Byron Lars (my favorite contemporary designer). The ivory hat is straight out of the 50s. It bears the label "Alfreda, New York and Paris." Its condition is remarkable given the light color and hundreds of seed pearls and crystals that make up the intricate design. 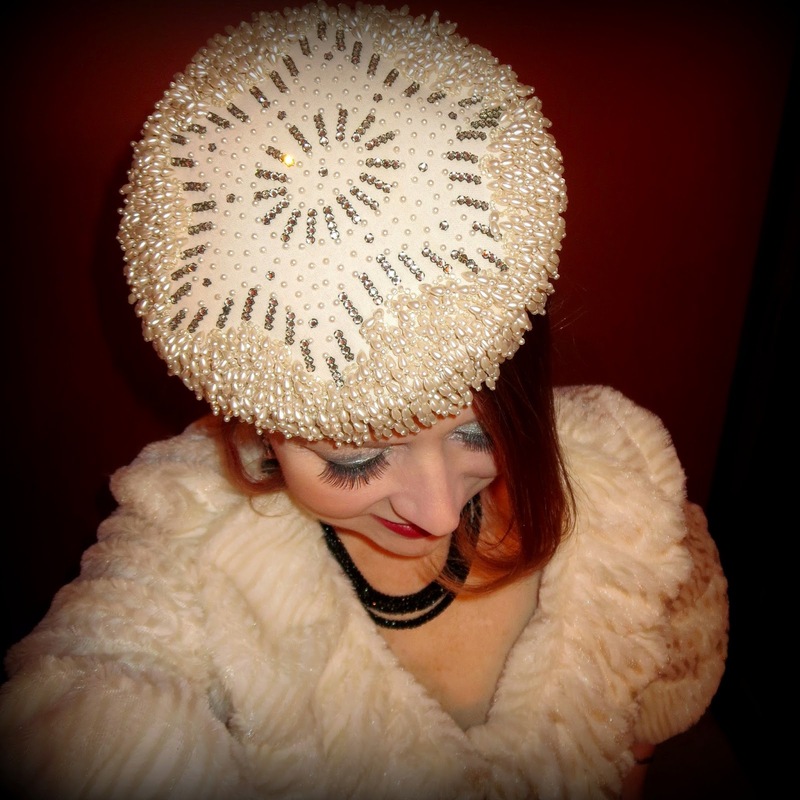 It's actually a "pillbox" style, originally intended to be worn more on the back of the head (think Jackie O). But, as I played with it, I discovered I liked it even more tilted forward - it's more flattering for my face shape and also allows me to better appreciate the fine bead and crystal work. It was the perfect statement piece for a cocktail reception in the Stutz Building, a historic downtown landmark filled with collector cars and art galleries, and accentuated the beaded embroidery work on a modern LBD. 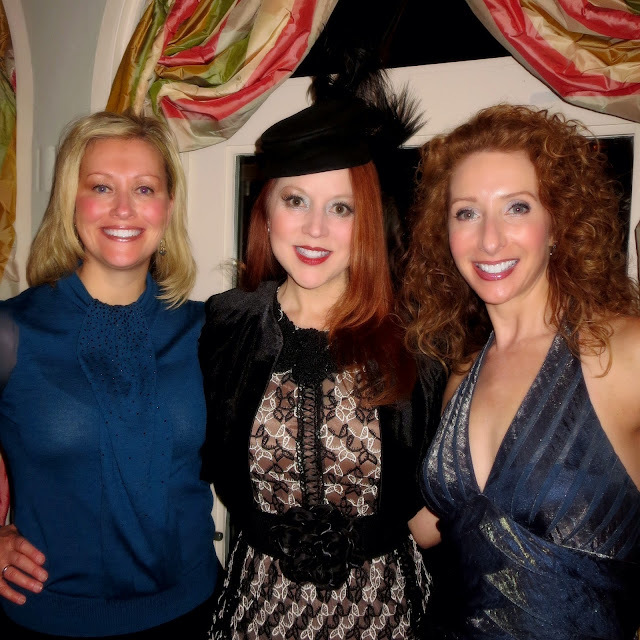 These two beautiful women are friends, colleagues, and fellow FAS members; This lace Byron Lars dress is one of my favorites and I've worn it several times, but it felt like a completely new outfit when I added the hat. Viva Vintage Clothing's Chicago Showroom is open by appointment only, but you can shop there without leaving the comfort of your own home. The boutique's website if user friendly and fun to browse. You can also keep abreast of new acquisitions on Facebook. And for more fabulous hat ideas, check out the Style Crone's monthly Hat Attack! Viva vintage! Fabulous hat, Jody! You wear it well. 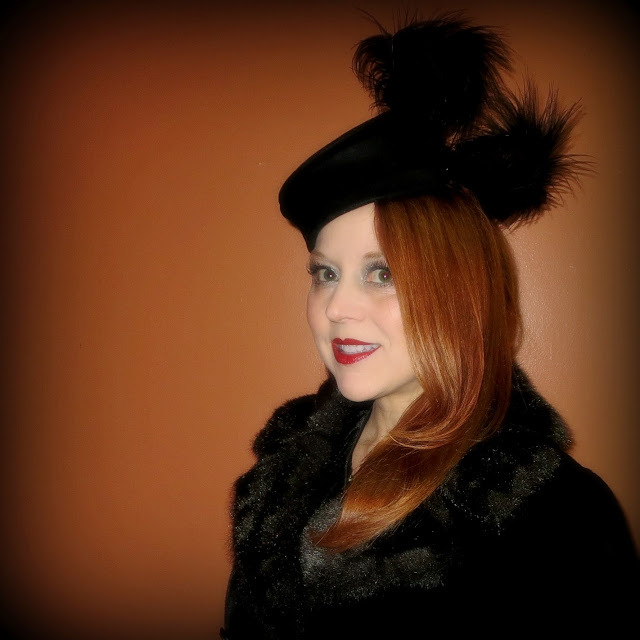 I've long appreciated the thrill of vintage hats, and you look spectacular in your choices. I'm off to view the Viva Vintage site. Thanks for sharing with Hat Attack! Thank you, Judith! I look forward to the parade of crowns on our site each month - thank YOU for bringing a community of chapeau lovers together! I saw your beautiful hat on Hat Attack and felt I had to let you know how stunning you look. Your black hat is equally as beautiful, as are your outfits. Thank you so much, Jill! I really appreciate it. Hat Attack is so much fun! I love connecting with others who wear hats with panache!